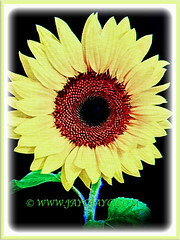 The Common Sunflower is a captivating and free-flowering plant. Flower heads tend to follow the path of the sun each day from morning to night, hence one of the common names, Golden Flower. 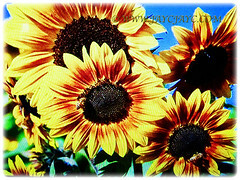 The Sunflower is the state flower of Kansas in the United States. It is also one of the city flowers of Japan and the national flower of Ukraine. Botanical Name: Helianthus annuus (syn. : Helianthus raids, Helianthus lenticularis). Common Names: Common Sunflower, Comb Flower, Golden Flower, St Bartholomew’s Star. Etymology: The genus name Helianthus comes from the Greek words helios meaning sun and anthos meaning flower. The specific epithet annuus means annual. Origin: Native to United States and Central America. Plant type: An ornamental, herbaceous and annual plant. 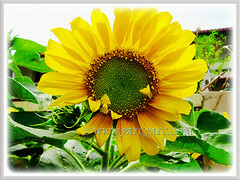 Features: Helianthus annuus is from the genus Helianthus that consists of about 70 species of flowering plants. Helianthus can be tall, erect annuals, tuberous or rhizomatous perennials. Helianthus annuus is a tall, fast-growing annual with an erect and rough-hairy stem, reaching between 1.5-2.7 m tall and spread 0.5-1 m wide. It produces coarse and simple leaves. The petiolate leaves are dentate and often sticky. It has broad, oval to heart-shaped, roughly hairy leaves 5-8 cm long and 5-6 cm wide. Sunflower leaves are evergreen, broad, coarsely toothed, rough and mostly alternate. It bears huge flowers up to 20-30 cm across with bright yellow petals and dark brownish or purplish centres. 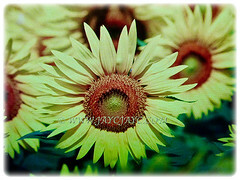 The daisy-like flower heads come in numerous colours of yellow, red, mahogany and bicolour rays with brown to purple center disk. The outer flowers which resemble petals are called ray florets. 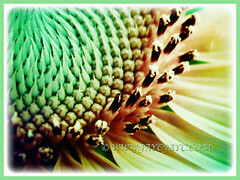 Each petal consists of a ligule composed of fused petals of an asymmetrical ray flower. The flowers are sexually sterile and may be yellow, red, orange or other colours. 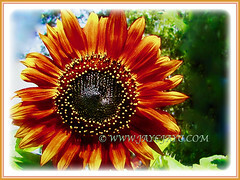 The center of the head called disk florets are very dark brown and appears to be almost black.Sunflowers are especially well known for their symmetry based on Fibonacci numbers and the Golden angle. 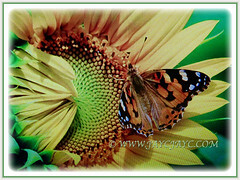 During growth, sunflowers tilt during the day to face the sun, but stop once they begin blooming. This tracking of the sun in young sunflower heads is called heliotropism. 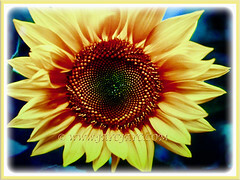 Culture (Care): Helianthus annuus or the Common Sunflower can be easily grown with minimum care. Moisture: Moderate to high water requirements. Can tolerate drought once established. Soil: Humus-enriched, loamy and well-draining soils. Others: Deadhead the flowers and foliage to keep the plants tidy and aesthetically pleasing. It may need staking, especially if grown in exposed location. A hardy plant that is generally free from serious disease or insect problems. Nevertheless, it is susceptible to chewy and sucking insects, downy mildew, broomrape and fusarium. 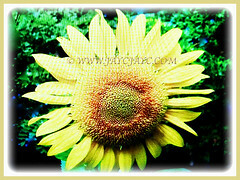 Helianthus annuus or Golden Flower is tolerant of high and low temperatures, although more tolerant to low temperatures with the optimum temperature range being 21-25°C. In summer this annual plant bears huge flowers up to 30 cm across with bright yellow petals and dark brownish or purplish centres. Plant seeds in the garden after last frost date. Plants grow so rapidly that there is little reason to start seed indoors. Taller varieties should be sited in locations sheltered from strong winds. Plant foliage often depreciates as the summer progresses. Removal of browned and tattered plants from the garden after bloom may improve the appearance of the landscape. If the plants must come down, consider saving the seed heads for feeding the birds in winter. Harvest seed from favorite plants for use the following year though some cultivars will not reliably come true from seed. Usage: Helianthus annuus or the Common Sunflower produces showy and ornamental flowers and will be great as a specimen or landscape plant. Ideal to be planted in a border or flower bed. Suited too for container planting or on the ground. It is a magnet for birds and butterflies. The edible Sunflower seeds are popular in breads, cereals, salads and many other dishes. It has medicinal uses where the flower heads with bracts are removed and boiled to make remedy for pulmonary problems and poultice of flowers are used for burns. Roots are chewed and applied to swollen area of rattlesnake bites after venom has been removed. American Indians used the flower tea for lung ailments and malaria. Leaf tea are taken for high fevers. Seeds and leaves are said to be diuretic and an expectorant.